A twist on the Rachel sandwich with roast turkey, spicy butter fried kimchi, tangy russian dressing and swiss cheese in rye that is grilled until golden brown and the cheese has melted. A couple of weeks ago I used some leftover corned beef to make reuben sandwiches and they reminded me of the rachel sandwich , which is essentially a reuben sandwich that uses turkey rather than corned beef. Last week when I roasted a turkey breast to make the roast turkey sandwich with artichoke tapenade, caramelized onions and roasted red peppers I made sure to save some to make a few rachel sandwiches and to try something new, adding kimchi! Kimchi is a spicy Korean fermented cabbage and it seems only natural to combine it with the sauerkraut since it is also a fermented cabbage. One issue with adding the kimchi is that kimchi can have a bit of liquid on it and since you don’t want a soggy sandwich it is a good idea to saute it a bit before adding it to the sandwich. I have to say that this is one tasty sandwich and with it we are off to a great start to April, the national grilled cheese month! 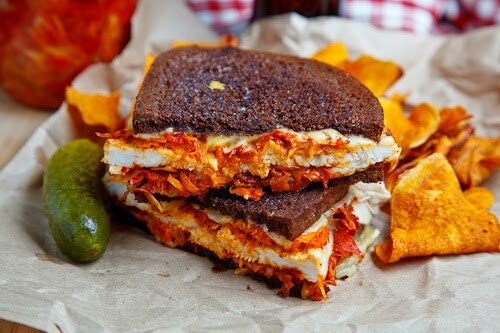 I served the kimchi rachel sandwiches with some sweet potato chips which pair well with the spicy kimchi. Butter the outside of each slice of bread, sprinkle half of the cheese on the inside of one slice of bread, top with the turkey, kimchi sauerkraut, dressing, the remaining cheese and finally the other slice of bread. I had never even heard of Kimchi but, even known I've already had dinner you are making me feel like going to the kitchen and having a sandwhich!! Man you are pretty much the sandwich king of the internet! I keep seeing these delicious sandwiches and grilled cheeses from your blog. This one looks delicious. The rachel sandwich with the additional of Kimchi sounds amazing! Wow! Who'da thought to replace the eastern european pickled cabbages with Korean pickled cabbage! Sounds like something I really need to try, especially since you used roast turkey instead of corned beef or roast beef (yay lean white meat over beef!). Thanks for the unique sandwich idea! Adding kimchi to just about anything makes it super delicious to me. 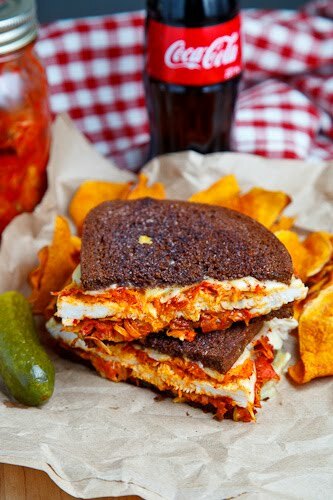 this sandwich is seriously KICKED UP! Wow – just the colors are mouthwatering, and then I read what's in the sandwich. You're so creative! Love Rachel sandwiches, the kimchi is brilliant! I'm a fan of Korean restaurants and like Kimchi. Sounds like you've got another hit on your hands with this sandwich. i'd take your sandwiches over rachel ray any day. you are the king of kicked up sammies boss! I like to chop and drain kimchi and put it on burgers and in grilled sandwiches. YUM! tried this and loved it! thank you.